The first Iranian domestically-made advanced tourist and passenger ship with the capacity of 220 passengers joined the naval fleet, Trend reported citing IRNA. The unveiling ceremony was held with the attendance of Iran’s Vice-President for Science and Technology Sorena Sattari and Gholam Hossein Mozaffari, Head of Kish Free Zone Organization. The ship called ‘Tarman Top Tours’ has been made by engineers and experts of Arvandan Company and is the biggest and the most advanced Iranian passenger ship. ‘Tarman Top Tours’ which has international certificate is also capable to carry 80 tons goods and 10 cars. Addressing the ceremony, Head of Arvandan Company Qorbani said that the ship was supposed to be made by foreign companies but due to their delay, Iranian experts manufactured it. 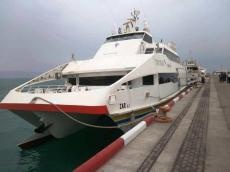 He added the ship is now giving services to passengers in Kish, Hendurabi and Charak Islands. Meanwhile, Mozaffari described unveiling the ship as an important step to reinforce marine tourism.